You really haven't shopped around until you've called us. 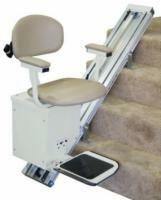 A1 Stair Lifts proudly carries electric powered stairlifts by AmeriGlide. These stairlift units operate on standard 110-volt household current, so no adapters or rewiring is required for home users. Both indoor and outdoor models are available, allowing you to choose a stair lift system that will best meet your individual needs. We offer the lowest prices on new stairlifts anywhere, but if you want to save even more, we also carry pre-owned and reconditioned stair lifts at even lower prices than our new ones! Imagine easily going upstairs to your sewing room. Imagine heading down to your basement workshop. Imagine living with increased mobility and safety. With AmeriGlide, you're free to enjoy your entire home again. Comfortable and Easy to Use. 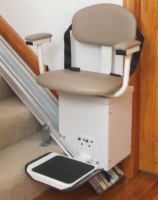 With a movable footrest and a deluxe backrest and seat with thicker padding, this stairlift offers unmatched comfort. The 180-degree swivel seat lets you get on and off effortlessly at top and bottom landings. Once you're seated, just push the control button and let the high-tech nylon wheels provide a smooth ride—every time. Our cargo lift is perfect for both residential and commercial applications, comes with a 350 pound weight capacity, and is the perfect tool to help you safely transport heavy loads. Enjoy access to your outdoor spaces with the Deluxe Outdoor Stair Lift, which has been specially upgraded to withstand the elements. All electrical components are protected and the lift comes with a durable cover that will keep the seat clean and dry. 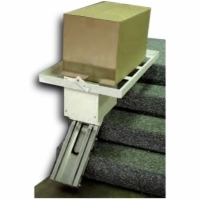 Need to sell your stair lift?